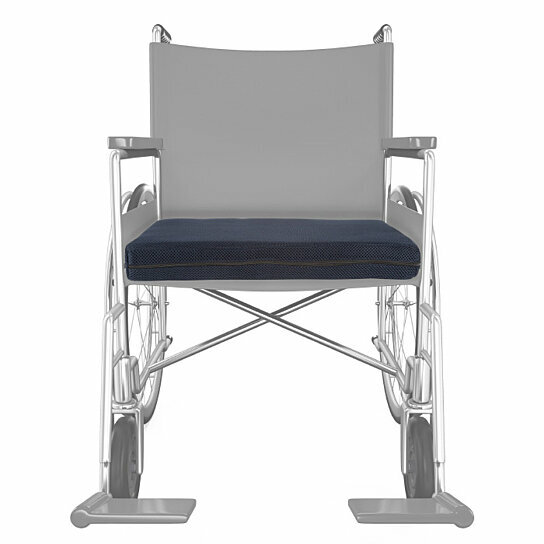 VERSATILE AND MULTIUSE- The large chair cushion features 2� of soft yet supportive foam-it fits most standard wheelchairs and is also ideal for cars, desks, office chairs, or even when cheering on your favorite sports team from the bleachers. SUPPORTIVE COMFORT- The cushion provides comfort and helps to relieve back pain and tension from sitting for long periods of time. It�s great to use at home or work and is also an excellent option for people who sit in a vehicle all day. EASY CARE- For easy cleaning, the mesh cover is removeable and machine washable! Simply remove the cover, wash on cold in the gentle cycle and air dry. Do not use bleach. PORTABLE- Lightweight with a convenient handle, the cushion is easily portable and travel friendly. You can add comfort to any seat and bring it with you wherever you go! PRODUCT DETAILS- Materials: Cover-100% Polyester Mesh; Filling-100% support foam. Dimensions: (L)18�x (W)16.6�x (H)2�. Color: Navy Blue.